The friends and supporters of the "Institut für Bagonalistik" can be found all over the world. To show who and where they are, I did this world map for "Fragmente" (published by Nicolai Sarafov) and for bago.net, the virtuell part of the "Institut für Bagonalistik". The original size is 42 by 21 cm. This editorial illustration is called "El Zoro y Bago". It's a duplex print (green and black) and features a page turn surprise (click&wait on the illu to see it). It's made of, well, mainly of found material, but was great fun to do. This illustration (PDF) was part of a sales bruchure I did for the "Congress & Tourismus Zentrale". 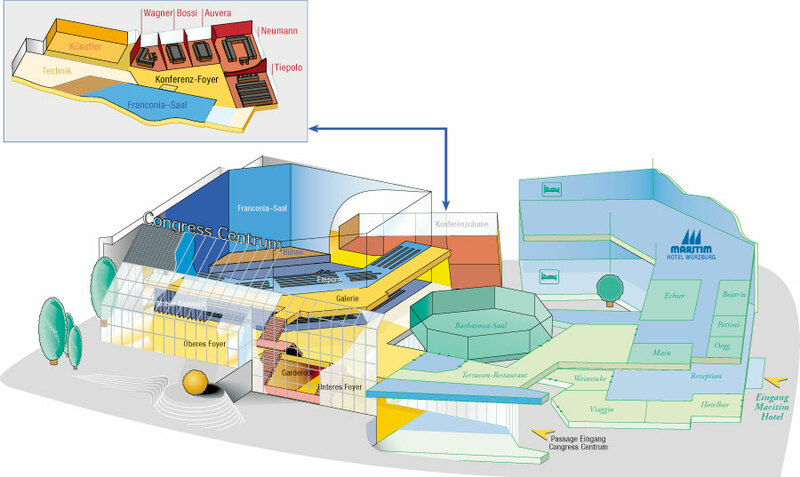 The Congress Center was the center piece of the bruchure featuring seating plans annd technical details. This was pretty hard work to do since all I had were blue prints from the architects. The township of Zell redesigned their streets, finishing the new bypass (yellow) and closing the old town entry on the east side (which was too small for trucks anyway). To make it easier for visitors and citizens to get used to the new traffic system, the town council gave us the job to create a new street map including the planned new housing destrict. We produced 3 large maps to be mounted at the town entries. The second smaller version was turned by 90 degrees to be used for other purposes, i.e. brochures. This was pretty much in the beginning of the long friendship and colaboration with Nicolai. The chapter was called "the history of jazz." We used badly xeroxed copper engraving from Nicolai's previous works and combining them with found material, photos from his archives and new drawings. The original illustration for "Fragmente" was a 3 color offset print (red, black and silver) on a yellowish paper done in Photoshop before Photoshop had layers, it's all done in channels. The large inkjet prints we did later for an exhitit at Hugendubel in Munich simulate the exact appearence from the original print. From all 7 spreads, the yellow one is my most favorite. This was a one week project about digital illustration. We went to the butcher shop, bought pig brain, went back to the photo studio and took a complete series of "brain" pictures in medium format. The result was a nice poster illustrating the myth of Daedalus and Icarus.